Why hasn't Prey 2 been released yet? According to Bethesda, the game just isn't up to snuff. First announced in March of 2011, Prey 2 has been stuck in a weird development limbo since that time. As far as anyone officially knows, the title is being published by Bethesda and developed by Human Head Studios, though recent rumors suggest that the game's current progress may be scrapped and development might shift to Dishonored creator Arkane Studios. In the midst of all this turmoil, IGN approached Bethesda's vice president of marketing, Pete Hines, to ask exactly what's going on. "We appreciate that folks are displeased that we haven't had any update or any info on Prey 2, but whatever your displeasure is, you can't even be remotely as unhappy about it as us," Hines states. 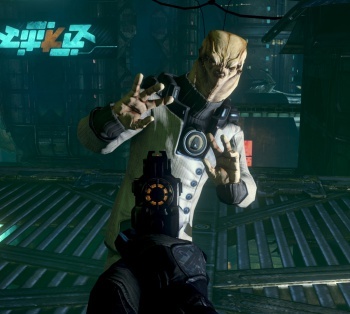 "We spent years and millions of dollars and a ton of effort trying to help Human Head make a great Prey 2 game. What we said the last time we said anything was that it's not up to our quality standards." It's interesting that he'd mention Bethesda helping Human Head in the past tense in light of those rumors I mentioned above, isn't it? Hines continues: "[Prey 2] is simply not good enough. We're not going to just proceed blindly with something that isn't good enough. "We spent a lot of time and money and effort trying to make this thing happen and support folks, but at the same time, you just can't keep throwing money at it and saying, 'sure, it'll eventually work.' You have to have the discipline to say, 'it's not good enough. It's not hitting the quality bar. Why isn't it? We've been at this for a while, and what we have is not what we talked about.' So that's where we are." The more Hines talks, the more those aforementioned rumors sound legit. Fortunately IGN picked up on this, and asked Hines to comment on the idea that the game has been taken away from Human Head. "I think all of the stuff that you've heard at this point has been from one side of this, and it's been somebody putting spin on it, like, 'here's what happened.' No, that's your version of what you think happened," Hines says. Curiouser and curiouser. Finally, Hines again reiterates that Bethesda will have more info for us just as soon as it's good and ready to share whatever it might know. "As we said in our last update, it's not good enough. It's not where it needs to be. When we have more info than that, we'll let you know." Whether you believe the scuttlebutt or not, it's pretty apparent that Prey 2 will remain in limbo for at least the foreseeable future. Here's hoping Bethesda will have some big news for us sooner, rather than later.